but first, what i take from the tale & why i wanted to paint it? as much as i LOVE to be home and cozy and content, we are undeniably all the richer for travel. even if anxious to be home again while we’re gone (“why, o why did i ever leave my hobbit-hole!” cries bilbo only four chapters in), we inevitably learn some things along the way. not just about other creatures (or people) different than ourselves, but about how we fit into the world. and what role Providence may have for us to play in it. and, of course, we grow stronger as we learn about our own self-prescribed limitations we inevitably stretch when we are required to adapt &/or survive the journey. 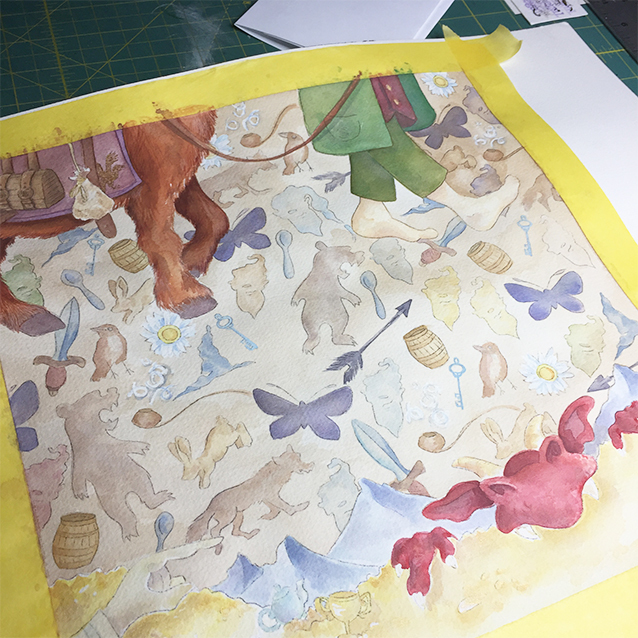 so let’s start with a few images of my “back again” painting in process, and later, i shall endeavor to whittle down the trivia and story embellishments. cool? and here’s a haphazard stack of my research materials and my trusty l’il moleskine in which i go back through all my books, taking note of marginalia and icons i want to include in the pattern background to help tell the tale visually. i created a thumbnail sketch for the final painting’s layout (which came to me while reading the book) on a vibrant post*it as you can see. er… i think that’s it! and i even have this piece available as a BOOMARK for those adventurous reads!! the original painting is available framed for $450, + $40 for safe US shipping. message me!